Today, I have exactly three weeks before my due date. Baby can come out anytime actually so we really need to be prepared. However, we're a little bit clueless this time. We were more prepared before we had baby Iqbal. It was easier because we didn't have anything baby related stuffs so we had to buy most things. It should be easier the second time, right? But somehow we find it difficult. Anyway, we tried to train baby Iqbal to sleep on his bed. We bought for him a car bed so that he'll be excited to sleep on it but it's not successful yet until today. He'd only be in his car bed when he's watching his movie, Barney and friends. Hehe.. Well, that counts I guess. 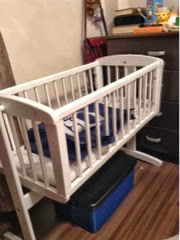 So just in case Baby Iqbal still refuse to sleep on his bed, we need plan B - buy a baby cot for baby A. We managed to find baby crib (swing) from Mothercare today. Had to get it today since it's their last day sale promotion. We bought a playpen for Baby Iqbal before but his cot is now full with his toys' boxes. Our room is definitely getting smaller now! Haha..